It has been a month since the AMD Ryzen CPU saw the light of day. Undeniably impressive in the multi-core stakes, the released quartet of Ryzen 7 chips make a solid case for being considered for your next performance PC build. Yet it's arguable that a CPU is only as good as the platform it is sat on top of, and such thinking is what has previously shied many away from the FX chips whose supporting motherboards are long in the tooth and short of modern features. That's largely changed with Ryzen, as the X370 and B350 chipsets, primed for Ryzen 7 usage, offer a feature-set that, on paper, is a solid match for Intel's Z270. However, early indications are that X370-based boards aren't quite there in terms of stability and robustness, underscored by multiple BIOS releases in quick order. Gigabyte is hoping to change all that with its newly-minted Aorus-branded boards, and initial indications are good. We had no problem in running our full suite of benchmarks and, unlike the Asus Crosshair VI Hero benchmarked with an earlier BIOS to show where Ryzen support was, this board ran with higher speed DDR4 memory without issue. 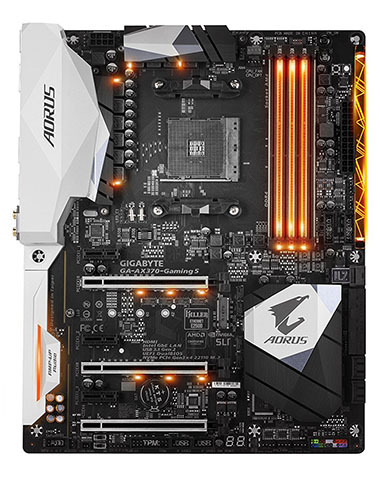 The board we are referring to is the Gigabyte Aorus X370-Gaming 5, which sits half way up the premium stack. At £200 and therefore £60 cheaper than the Asus, Aorus pricing is comparable to the Intel equivalent - Z270X-Gaming 5 - as is the look and feature-set. 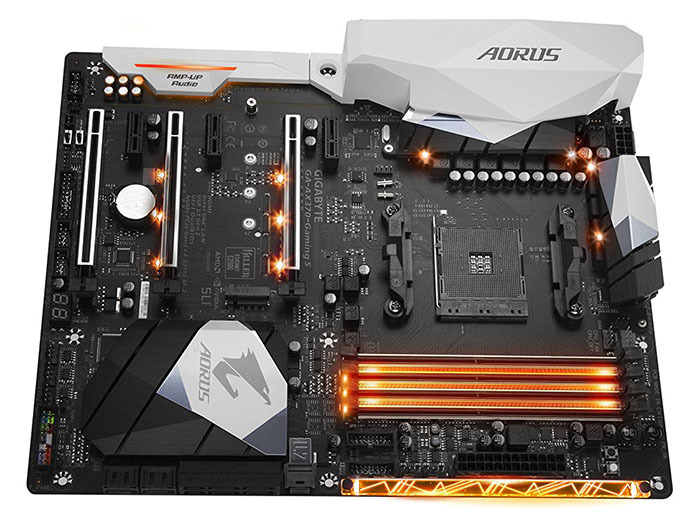 There's the inevitable array of RGB-infused lighting, dubbed Fusion, with Aorus providing Windows-based software support for tinkering with the LEDs' colour. Unlike others, this extends to the DIMM slots as well as 10 other lights dotted around the board and a light strip down the right-hand side. If it's lights you're after, the X370-Gaming 5 suits you well. One complaint of X370 boards has been the hit-and-miss memory support, with many forums users mentioning they are unable to run at XMP timings using even DDR4-2,666 RAM. We encountered no such issues with the F5d BIOS that would happily run a set of G.Skill memory at 2,933MHz, though we knocked it down to the officially supported 2,666MHz for testing. X370-Gaming 5 goes overboard in terms of fan headers. There are eight on board, including a trio that service all-in-one watercoolers and a duo for CPU, and each one is what Aorus calls hybrid. What this means is that each fan header can adjust the power and speed of the fans, which comes into play well when fine-tuning a build. We're not as pleased when it comes to storage, as Gigabyte has prioritised SATA over the much-preferred PCIe-based M.2. Eight SATA ports are offered, sharing bandwidth with the almost-defunct U.2 and SATA Express. This leaves just a single, 110mm-long M.2 inconveniently located between the strengthened top and bottom PCIe x16 slots. The Z270 version has two M.2 slots, which is what we would like to see here. We do, however, like the debug LED along with dual BIOSes and, to the extreme right, a bevy of enthusiast-oriented buttons that control power, reset, clear CMOS and one-touch OC. For the real tinkerers, there are even a couple of temperature-measuring points and compatible wires in the box. The board is well-stocked with audio, as Gigabyte Aorus offers the updated ALC1220 Codec twice. The reason for doing so rests with having high-quality audio output from both the IO section at the back and from an onboard header routed to the front of the case. The Codec pairs up with Creative's X-Fi MB5 software for some DSP presets. For graphics, Nvidia and AMD are both supported in quad-GPU mode split over two cards. Understanding just which output comes from where is a task in itself. The combination of X370 chipset and Ryzen CPU offers two USB 3.1 Gen 2 (red), six USB 3.1 Gen 1 (two on back, four from onboard headers), and a further four USB 2.0 again through onboard headers. If that's not enough, ASMedia's own USB controller is added to the mix to offer Type-C USB 3.1 Gen 2 as well as a same-specification Type-A. Adding it all up leads to 10 USB 3.1 ports on the back. Phew! Notice the HDMI connector? It's pointless for the Ryzen chips as they don't feature on-chip graphics but will be useful for the next generation of APUs. Finally, as this is a board that goes above and beyond in almost every category, an Intel Gigabit NIC is augmented by a Killer E2500. Perhaps the only missing part is WiFi, though that's a stretch at a £200 price point. The firmware is a direct copy of that found on the Intel-based Gaming 7, which means above average fan control (Smart Fan 5). There's compatibility with the Windows-centric Easy Tune and System Information Viewer software, too.